US astronauts spotted UFOs on the Moon? M. Collins, and E. Oldrin. Having flown to the Moon for several hours, the crew reported that some “shining balls” were on the heels of the spaceship. The balls were reportedly trailing Apollo 11 flying the same maneuver patterns. The whole world but USSR and China was listening to live broadcasts from Apollo on the Moon. One of the broadcasts from the crew seemed weird: “I can see many small craters … Those craters measure from 6 m to 15 m in diameter. There are some tracks approximately half a mile away from our ship, they look as though they have been left by a tank.” Suddenly millions of TV viewers around the globe heard some strange sounds resembling the breath of a locomotive combined with the buzz of an electric saw. NASA’s operator sounded pretty worried on the air: “Are you sure that you did not communicate with THEM?” The crew checked a transmitter. It was obvious that the strange sounds were coming out of somewhere else. Armstrong changed a frequency and asked the operator: “I want to know what it is going on here,” The operator could not understand a thing either: “What’s happening? Is anything out of order?” The crew replied: “Sir, there’re big objects over here! Goodness! They’re really huge! Are they sitting on the other side of the crater? They are here on the Moon watching us!” Ironically, the astronauts were located at the Sea of Tranquility at the time. Five hours later, Armstrong and Oldrin finally decided to climb out of the ship as tensions eased a little. Collins, who stayed on board the orbiter, had been warned to standby for an emergency escape from the Moon. Then Armstrong got stuck in an exit manhole. For awhile humankind could hear nothing but his wheezing breath and the sounds of his tossing and turning in the dark. Photographs took the opportunity to take a series of historic pictures of the NASA staff going grey and Armstrong’s relatives with panic-stricken eyes glued to the monitors. At long last, Armstrong moved down the ladder and took the first step onto the lunar surface. He then said those famous words: “It’s a small step for man but a big leap for humankind!” Having walked about a hundred meters along the Moon, the astronauts got back into a lunar module for docking with the orbiter in two hours and thirty minutes. The mysterious objects were also spotted during other lunar exploration missions. Unofficial sources say about two incidents involving some unidentified disks, which came close to Apollo 8 while flying at 11,000 km per hour. Instruments and radio equipment of Apollo 8 went out of order during those encounters. The astronauts Stafford and Sernan of the Apollo 10 mission photographed the flyby of an unknown white object over the Smith Sea. In November 1970, the astronauts Scott and Irvine were riding on a lunar rover in the vicinity of the Apennines in November 1970. At the same time, their crewmate Warden took a picture of another “easy rider” zipping above the lunar surface at a low altitude. In April 1972, two crewmembers of Apollo 16 were roving around the edge of the Descartes Crater. Suddenly they noticed some moving objects on the side of the hill. They reported the incident right away to Houston and filmed the objects. 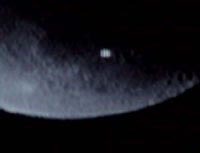 They also saw a large UFO fly near the surface of the Moon. Their crewmate Mattingley was watching the scene as he floated in an orbiter. He confirmed that the incident was not a hallucination. The mission commander John Young found a glass prism in the lunar dust. The prism is estimated to be several thousand years old. In the fall of 1973, NASA slightly lifted up a shroud of secrecy by confirming that 25 astronauts in total had seen the UFOs during a number of lunar exploration missions. Speaking to Esotera magazine, Werner Von Braun, head of the lunar exploration program, made it quite clear that “the extraterrestrial powers do exist, and they are more powerful than previously thought. I’m not authorized to give you any more details on the issue.” The Soviet probe Luna 24 took the lunar soil samples and took off the Moon on August 19, 1976. It was the last time when a man-made spacecraft disturbed the peace of the ancient lunar dust. Humans will probably resume manned flights to the Moon in 2015 if the plans for the construction of a lunar manned base get off the ground in the above year.